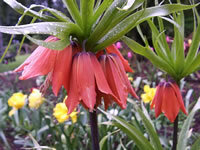 Crown Imperials are impressive, spring flowering bulbs that have been cultivated since the 16th century. Once the stalk begins to emerge in mid-spring, it grows very quickly to a height of 3-4 feet and adorns itself with a crown of nodding, bell shaped flowers topped with a pineapple-like tuft of bright, glossy green leaves. The flower clusters last about 2-3 weeks. One downside to these exotic looking plants is that the bulbs have the fragrance of Eau D'pew. The upside is that the skunky aroma tends to repel moles and other rodents away from your bulb garden. Crown Imperials are excellent for mass plantings. They thrive when they are grown in planters or tubs. 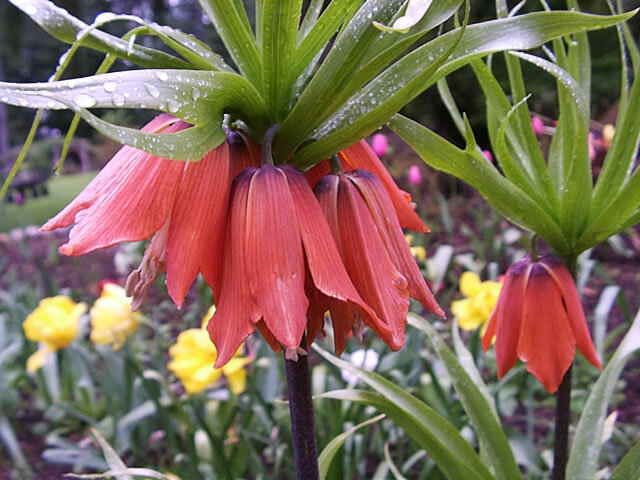 The Crown Imperial Fritillaria is hardy in USDA zones 5-9. In northern zones, they should be grown in full sun, but in hot summer regions they will require partial shade. Crown Imperials require evenly moist, fairly rich, sandy soil that is very fast draining. Purchase fresh bullbs as soon as they become available in early fall because the bulbs have a tendency to start producing roots while still in their package, so they should be carefully planted as soon as possible. Prepare the planting hole by adding a 2" layer of coarse builders sand or fine gravel at the bottom of the hole to prevent rot, and adding bone meal and a generous amount of compost to the removed soil. Place the bulb on its side, on top of the sand base so that the bottom of the bulb is 8" deep. Fill in the hole with the prepared soil. Water regularly and thoroughly throughout the growing season, but reduce watering when your Crown Imperial goes dormant. After flowering stops and the leaves die off in mid summer, cut the stems back to just above the ground level, then mark the spot with a stake. Provide a heavy winter mulch, which should be removed and replaced with a top-dressing of compost in the spring. 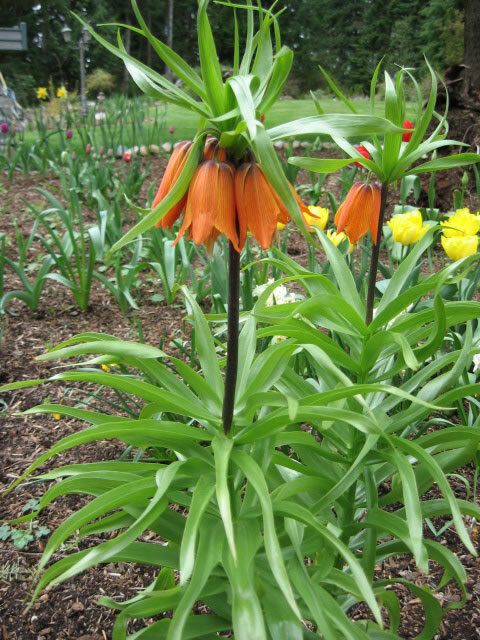 Established Crown Imperial plants resent being disturbed, but they can be propagated by digging and dividing offsets from the parent bulbs in the summer, after the foliage has ripened. Pot up the smaller bulbs immediately and hold them in a bright, protected area for the first year, to allow them to develop. Larger bulbs should be replanted immediately into their permanent spot in the garden. 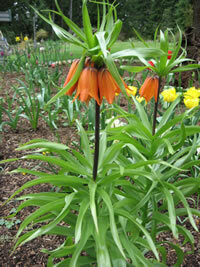 Crown Imperial plants grown from seed will take up to 5 years before they produce their first blooms. Fritillaria seeds require a minimum of 3 weeks of cold stratification before germination. The seeds should be sown into flats as soon as they are ripe and barely covered with fine soil before placing the flat in a cold frame or covering it with plastic and digging it into a protected area of the garden. the seeds will germinate in the spring, but allow the seedlings to grow on in the flat for the first year before moving them to the garden in the fall.